Self-driving cars are have moved quickly from sci-fi fantasy to impending reality. Progress on key technical and business hurdles – building massive bases of driving data and precise maps, training extraordinarily complex deep learning systems, and designing high performance yet cost effective in-vehicle systems – continues, with commercially viable fully autonomous systems as little as 2 years away from seeking regulatory approval. The stakes are huge – $7.8T in annual ground transportation spending – and dozens of companies are investing to take part, each choosing one of two different developmental roads requiring very different technical and commercial approaches: 1. Incrementally adding autonomous features to vehicles sold to individual drivers; or 2. Building fully autonomous vehicles intended for commercial fleets providing transportation as a service. 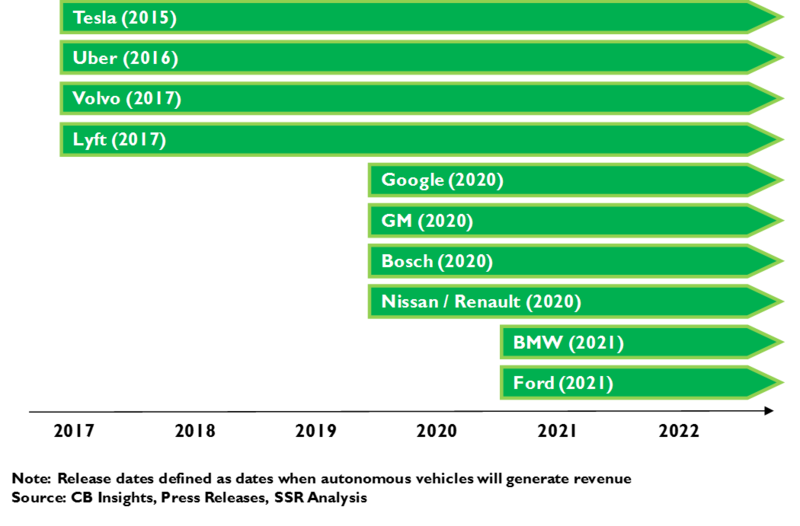 Most incumbent automakers and their suppliers have chosen the first road, with TSLA and MBLY the most prominent standard bearers. Road 2 has GOOGL, Uber, BIDU, and several startups. We believe that the disruptive road 2 is the much bigger long term opportunity, with GOOGL leading its hard charging rivals in the race to the prize. For incrementalists, we see ample opportunity for component suppliers to sell arms to all sides, but do not believe that any of the auto brands is likely to pull far enough ahead to make a competitive difference. Huge stakes for self-driving race. The $100B annual spending on taxis and livery service is only a small piece of the market addressable by autonomous vehicles. Some $4.5T is spent globally on private automobile ownership and operation. Another $86B is spent on local delivery services, and $2.2T on long-haul trucking. Moreover, because self-driving cars have the potential to drastically reduce accidents, require significantly lower government spending on infrastructure (parking, road construction, etc.) and services (traffic cops, etc. ), and contribute significant intangibles to communities (reduced congestion, less pollution, etc. ), the overall value created could be well into the tens of trillions of dollars annually. Incrementalism vs. disruption. Most incumbent automakers, their suppliers and associated startups are incrementally adding autonomous features – e.g. automatic emergency breaking, self-parking, highway autopilot, etc. – to their traditional products with a view to on-demand autonomous operation as an adjunct to driving. In contrast, disruptors – led by GOOGL, Uber and BIDU – are looking to enable fleets of driverless vehicles offering transportation as an on-demand service. The difference in objectives is driving very different development decisions by the participants on either path. Building block #1 – Seeing. 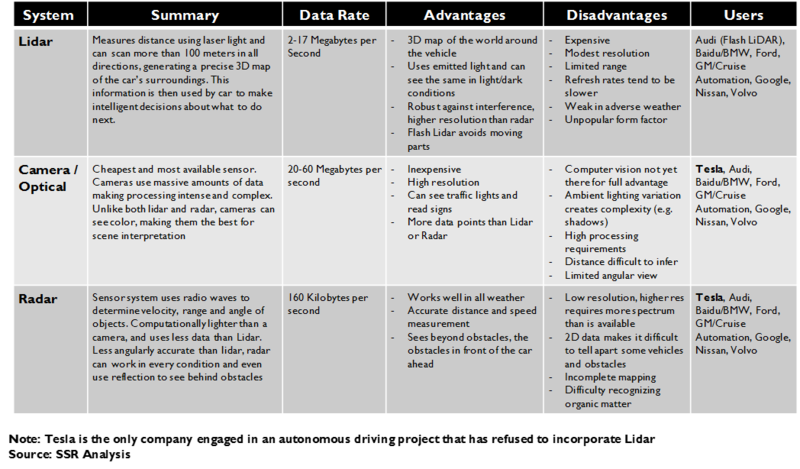 LIDAR systems are expensive, but have significant advantages over the camera/radar only alternatives. LIDAR has a long range 360-degree view with true 3D mapping without need for ambient light. Camera-based solutions have a limited forward 2D view subject to available light, requiring substantial in-car image processing to map the vehicle’s environment. The incrementalists have universally chosen camera-based systems, like the MBLY module implemented in TSLA models, due to the $10K per car cost and obtrusive rooftop turret required by LIDAR. The disruptors can absorb the higher per vehicle LIDAR cost in the context of much higher utilization, and be patient for prices to fall as volumes build. #2 – Driving. The deep learning systems that make the split-second decisions for autonomous cars depend on enormous bases of driving data and extraordinary scientific talent. GOOGL, representing the disruptive approach, has collected nearly 1GB/second for more than 3.2M miles of largely city driving (including nearly 2M autonomous miles) for more than 100 petabytes of total data. In contrast, leading incrementalist Tesla can pull data from more than 2M mostly-highway miles driven by its autopilot equipped customers each DAY, but collects no more than 0.1% as much data per mile. Overall, the disruptors have a huge advantage in AI talent, and, we note, that highway autopilot functionality is not a direct stepping stone to full autonomy. Moreover, incrementalists must build in the intelligence to hand control from driver to vehicle and back smoothly and safely, while disruptors do not. #3 – Navigating. Comprehensive, precise and real time maps of routes and traffic are crucial to inform sophisticated trip routing and to guide driving decisions. For incrementalists, navigation is a possible differentiator, but for disruptors, who will depend upon it to guide resource allocation, push utilization, and deliver prompt service, it will be even more important. #4 – Coordinating. Self-driving vehicles will rely on communications and logistics systems to manage the vehicle’s interactions with its environment. How will passengers hail and direct the cars? How will the cars talk to each other to assure safety and efficiency? How will communities direct autonomous vehicles in an emergency or law enforcement situation? How will a fleet operator manage its fleet? Given that the private autonomous vehicles produced by the incrementalists are still likely to have licensed drivers available to take control, some of these functions may be nice to have rather than need to have but they will be a critical consideration for disruptors. Disruptors are advantaged for full autonomy. A partial solution is not necessarily a head start toward a fully self-driving vehicle – deep learning systems may need to start from scratch to address the general solution, putting the disruptors ahead of the game. Incrementalists, unwilling to absorb the added cost of LiDAR and the styling implications of roof mounted turrets, collect dramatically less data for each mile driven, leaving boasts of millions of driving miles seriously misleading. Fleet-minded disruptors, with their much more capable sensor arrays and powerful processing solutions, will have the lead in safety testing, likely a primary hurdle for regulatory approval. The disruptors, most notably GOOGL, also have huge advantage in the AI talent needed to make efficient progress toward full autonomy. GOOGL is the team to beat. GOOGL has a lot of advantages. It has been at it the longest, launching its self-driving car initiative in 2008, with more than 2 million miles with LIDAR sensor arrays under its belt. It has the most impressive roster of deep learning talent in the world. It has the most detailed and comprehensive map data. 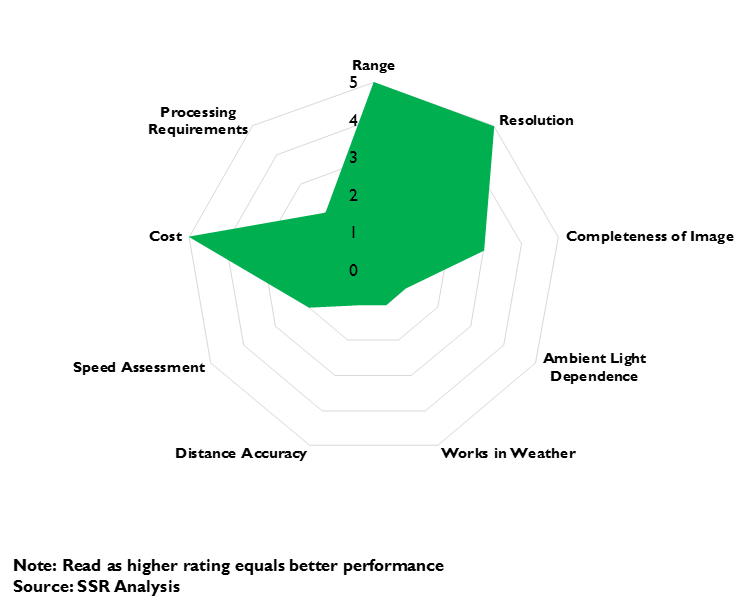 It has a well-established and extensive real time traffic feedback system. A recent shake up in the management of the self-driving research unit, suggests a clear shift toward near term commercialization. Its most capable rival, Uber, acknowledges GOOGL’s head start, although it too has strengths, such as fleet logistics systems and relationships with local governments. BIDU is a wild card, with strong AI and the advantage of favorable regulatory environment in China. Startup NuTonomy has a similar home field advantage in regulation friendly Singapore. 8 years after GOOGL announced that it was working on self-driving cars to the bemused derision of most observers, autonomous vehicles are now a big thing. Uber CEO Travis Kalanick called out GOOGL’s program as an existential threat, dialing up his company’s investment and pillaging Carnegie Mellon’s crack robotics faculty. BIDU has intriguing partnerships (NVDA, BMW), AI and mapping chops, and friendly Chinese regulators. TSLA launched its controversial semi-autonomous Autopilot feature in late 2015, with CEO Elon Musk calling for full autonomy inside of 3 years. Former TSLA partner MBLY has linked up with Intel, Delphi, VW, BMW and GM. All of the world’s major automakers have at least a foot in the water. Secretive AAPL has a 1,000+ engineers at work on an automotive project which is rumored to be developing its own autonomous driving technology. The opportunity is massive. Globally, $7.8T is spent annually on vehicular transportation of people and things – livery, private cars, delivery, trucking, etc. All of it is addressable by autonomous vehicles that are safer, more convenient, less taxing on infrastructure, cheaper to operate, and, potentially, likely to have dramatically higher utilization. We see four different tasks which self-driving solutions must accomplish – seeing, driving, navigating, and coordinating – each with technical hurdles to overcome. The companies pursuing this opportunity have split into two groups following separate development paths. The first group – the disruptors, led by GOOGL and including Uber, BIDU, and others – are aiming to build fleets of fully autonomous vehicles offering transportation as a service. These vehicles will rely on the fusion of inputs from multiple sensors, including expensive LiDAR arrays, that give a 360-degree 3D view of surroundings – even in darkness. The second – the incrementalists, comprised of most of the world’s automakers (notably TSLA), their suppliers, and associated startups (notably MBLY) – look to add autonomous functionality piece by piece to cars intended for private ownership. These players are using camera-based sensors to save expense and the unsightly turrets necessary for the 360-degree 3D views. We believe the disruptors, free from the need to protect an existing market, will win. More robust LiDAR based vision, superior AIs purpose built for true driverless operation from much deeper driving data, and market entry via fleets of vehicles providing transportation on demand, will allow them to beat the incrementalists to full autonomy with a safer and better performing product. The high price of LiDAR will be easily offset by high utilization in fleet operation, and the cost should come down quickly with Moore’s Law as volume builds. The disruptors will also be able to concentrate on gaining regulatory approvals on specific municipalities for concentrated fleet operations, vs. selling autonomy broadly to private car buyers across many jurisdictions. Moreover, we think that autonomous transportation-as-a-service will quickly begin siphoning demand away from private vehicles. Technology wise, GOOGL has the inside track, with its world best maps and impressive all-star roster of deep learning talent with 8 years and 3 million plus miles working on self-driving. Uber, having looted CMU’s robotics department, is hoping it can get in the ballpark on technology fast enough to let its strengths in logistics, branding and municipal negotiations put it in front. BIDU has the advantage of friendly policy makers in China, likely giving it a leg up in gaining early approvals to deploy service. Startup NuTonomy hopes the same home field advantage works for it in Singapore. Science fiction writers have always been timid about autonomous driving. Star Trek computers can carry on a human conversation, WARP drives can push the Enterprise faster than the speed of light, Dr. McCoy can heal almost any injury or ailment, yet Mr. Sulu still drives the ship by hand. When Google launched its self-driving initiative eight years ago, most observers considered it an outlandish waste of company resources. A few years ago, when car makers began to show vehicles that could back themselves into a parking space or jam on the breaks precious milliseconds before a human driver could react to a potential accident, full autonomy was still considered a distant future. Today, enough Teslas with highway autopilot have been sold and enough reporters have been given rides in Google’s bubble cars, that the skepticism around the idea of fully autonomous vehicles has significantly eroded (Exhibit 1). Predictions for fleets of driverless taxis, convoys of self-driving long haul trucks, and garage-to-garage auto-pilot for private cars are getting more aggressive – 2025 has become 2020, with a few outliers like Elon Musk saying even sooner. With signs of dramatic progress on the state-of-the-art in deep learning, the cost of LiDAR sensors dropping, and jurisdictions willing to support the testing and rollout of autonomous transportation services, we believe that multiple communities will have piloted true driverless taxi service before decade end. Successful early deployments – confirming the benefits of greatly improved safety, convenience, environmental impact, and burden on public infrastructure and services – should hasten acceptance by more cautious governments. Motor vehicle transportation is a gigantic global industry (Exhibit 2). It is not only the vehicles themselves – cars and trucks sold to private owners and into working fleets with hired drivers. It is also the costs of owning them – maintenance, repair, parking, fuel, insurance, etc. It is also the costs of accommodating them – infrastructure spending, environmental impacts, health care and emergency response for accidents, law enforcement (Exhibit 3). All in, something more than $5.5T is spent each year on driving. Self-driving vehicles have the potential to displace a lot of this spending. Without drivers, autonomous fleets can operate with lower costs and at much higher utilization rates, providing cheap, safe, reliable and convenient transportation on demand as an increasingly attractive alternative to private vehicle ownership. Autonomous vehicles will have far fewer accidents, yielding dramatic reductions in repair and insurance costs. They will not need convenient parking, and will spend many fewer hours idle each day, so the sheer number of vehicles required will be much smaller. Self-driving cars and trucks will be mostly electric, and AI drivers will likely be more efficient than human drivers. Communities will derive many benefits – greater public safety, repurposing of parking areas, better services for the elderly and infirm, less pollution, lower spending on infrastructure and traffic enforcement (Exhibit 4). Convoys of self-driven trucks without need for rest stops will reduce ground transportation costs and raise competition with rail and air. Autonomous vans will make delivery even more attractive, although cheap autonomous taxis might entice more people to go shopping. The transition will take time. While we expect multiple markets to be operating with self-driving fleets by 2020, the revenues will be small – perhaps less than $1B/yr (Exhibit 5). Only as acceptance spreads to the largest markets and as a meaningful share of consumers opt to rely on the services as their primary transportation option will we see the potential for sea change. This could see the market hit the double digit billion-dollar market by 2025. By then, we would expect autonomous delivery and long haul transport gaining their own significant footholds. By 2030, we believe the cost and convenience advantages of subscription transport on demand vs. private vehicle ownership will be compelling to most consumers in medium-to-high density communities, and some forward-focused municipalities will have banned private vehicles entirely. SAE International (founded as the Society of Automotive Engineers) has defined five levels of autonomy ranging from traditional cars with no autonomy at all, to robo-cars without an option for a human driver (Exhibit 6). Level 1, labeled “Driver Assistance” entails a single element of automation, either accelerating/braking or steering, that can be engaged by a driver under specific circumstances. Level 2 is called “Partial Automation” and allows for control over both accelerating/braking and steering in specific circumstances under the supervision of a driver. 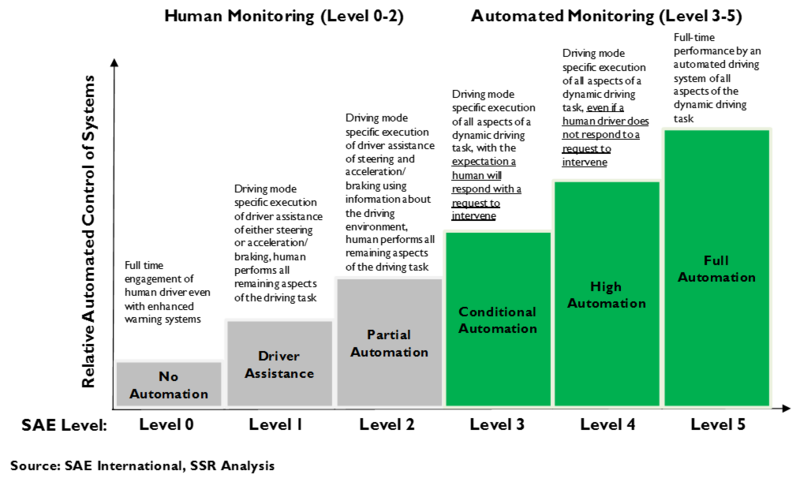 “Conditional Automation” refers to a vehicle that can execute all elements of driving, but with the expectation of human intervention upon request. L4 or “High Automation” are vehicles that are prepared to request human intervention, but able to safely complete a driving task if that intervention is not given. Finally, Level 5, or “Full Automation”, are vehicles that are fully capable of completing all driving tasks without any expectation of human intervention. In practice, L1 encompasses cars that brake automatically to avoid impending accidents, such as backing into a pole in a parking lot or rear ending a car in stop and go traffic. “Lane Assist”, which alert the driver and steers the car back into line when it drifts across a lane marker, would also count as an L1 feature. Tesla’s Autopilot, which takes full control of the car during highway driving conditions, qualifies as Level 2, as does a feature offered by Mercedes Benz (which cautiously limits self-driving to one minute stints). Audi and BMW have offered “traffic jam” modes, which can control their cars during stop-and-go traffic, another Level 2 implementation. No production cars currently meet the L3-L5 standards, although most test vehicles fall into Level 4, able to complete most trips without a driver, but relying upon human backup in case of unforeseen conditions. At level 5, autonomous taxi services without human drivers are finally possible, with confidence that the system will react competently to any scenario that arises. The race for level 5 autonomy has competitors choosing from two very different roads. 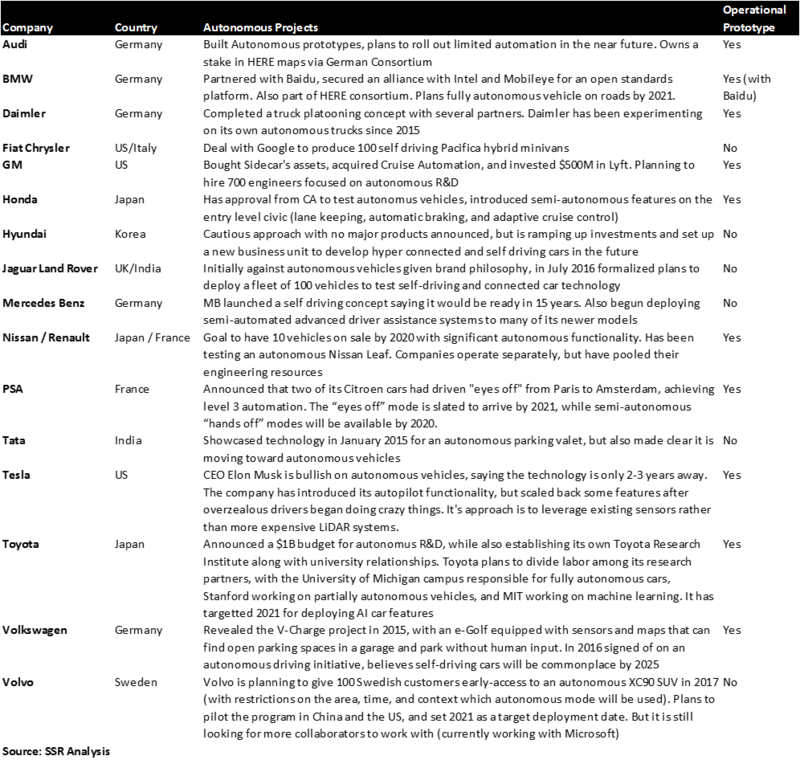 Most of the incumbent automakers (BMW, Volvo, Audi, Toyota, and many others), automotive suppliers (Delphi, Bosch, etc. ), and tech partners like MobilEye, Intel and Nvidia, are concentrating their resources on moving one level at a time, adding autonomous capabilities to traditional vehicles. The obvious example of this is Tesla’s controversial Autopilot, which allows a driver to cede control to the car for highway driving – maintaining speed and lane positioning, while monitoring and reacting to the actions of other cars. As the conditions warrant – e.g. exiting the highway, transition to two-way traffic, an unexpected detour – the driver is alerted to take control. We label the companies taking this approach as “incrementalists” (Exhibit 7). Incrementalists primarily look to these autonomous features to differentiate the vehicles that they sell and lease to private buyers. Fleet operations for transportation as a service are a secondary consideration, with the belief that solving autonomy bit by bit for private cars will get them to full driverless operation in ample time to serve that market when it emerges well into the future. However, incrementalism does impose practical considerations on technical choices. Innovations should be rolled to production vehicles as quickly as feasible, so as to create differentiation in the market. As such, cost-per-vehicle is a very important consideration – adding $20,000 worth of sensors to a $80,000 car is a non-starter. Similarly, the aesthetic implications of a rooftop turret also make current LiDAR sensor options untenable. Incrementalism also affects the developmental approach for the deep learning AI at the core of the system. Rather than jumping into the fully autonomous use case, which requires solving for idiosyncratic local driving conditions (e.g. hard to predict pedestrians and animals, humans directing traffic with gestures, reading road signs, questionable street conditions, etc. 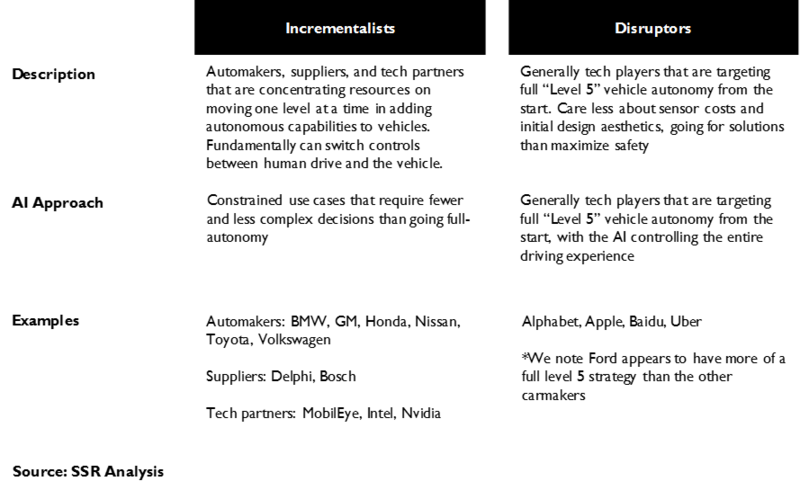 ), incrementalists focus initially on constrained use cases with dramatically fewer decisions to make. First, there were self-parking systems, now highway autopilot, where the decisions are limited to maintaining speed with traffic, managing lane changes, and responding to other vehicles on the road, with the ready option of forcing a transition back to driver control if conditions go beyond the capabilities of the system. This also highlights an added burden on incremental systems – managing the process by which control is exchanged between the vehicle and a human driver. Done poorly, this exchange becomes a significant point of safety risk. In contrast, “disruptors” are companies targeting full Level 5 driverless autonomy from the start. Here, the big names are Alphabet and Uber, but Baidu is a strong player and Ford has bucked the ranks of its fellow automakers by focusing its development on fully autonomous vehicles. We note that Singapore-based startup NuTonomy has launched a driverless taxi trial in its home city. Disruptors care less about the cost of sensors – time and volume will bring down prices, while eliminating the cost of a driver in a high utilization fleet vehicle overwhelms the cost of the sensors – and are comfortable with the aesthetics of roof-mounted turrets. Disruptors, aware of the highly political process for gaining operating approval from governments, will go for the solution that maximizes safety. On the AI side, disruptors are clear in their belief that a solution for the constrained case of highway driving is not necessarily an effective stepping stone to a general self-driving AI appropriate for all conditions. Traditional software development breaks problems down to atomistic modules that can be assigned to separate teams and synthesized into a complete solution at the end. Deep learning begun with a constrained data set will find an optimized solution for that specific use case. Adding very different use cases can require taking many steps back to find an optimal solution that accommodates a much broader set of conditions. At the same time, solving for full autonomy saves the disruptors the need to manage the transfer of control. Fully autonomous transportation-as-a-service will depend on technology development on four distinct vectors – Seeing, Driving, Navigating and Coordinating (Exhibit 8). Seeing is the sensors that an autonomous vehicle uses to monitor its surroundings and the software and processing needed to convert the data provided by sensors into a single, coherent live map. Driving is the system that interprets the live map, makes decisions on how best to proceed safely and efficiently, and executes those decisions by controlling the vehicle. Navigating systems determine where the vehicle is going, what route it will take to get there and how long it is likely to take – incorporating precise and to the moment maps, traffic reports, weather reports and other information. Finally, fully autonomous vehicles will require coordinating systems to manage how they are summoned, how traffic can be balanced across a fleet, how vehicles might communicate with each other, and how community authorities might communicate with the vehicles. Solutions for each of these vectors are likely to be very different depending on the development road – incrementalism or disruption – chosen. Seeing – What’s Goin’ On? Self-driving starts with sensors that replace a human driver’s eyes and ears. There are three main categories of these sensors – LiDAR, cameras and radar – generally used in combination, along with microphones (for sounds, like a police siren) and ultrasonic sonar (for very close proximity assessments, often needed for parking) (Exhibit 9). Each of the three main sensor types has strengths and weaknesses, which we have categorized into 9 buckets – Range, Resolution, Completeness, Ambient light dependence, Weather vulnerability, Distance accuracy, Speed assessment, Processing requirements, and Cost (Exhibit 10). In many ways, LiDAR is the most capable of the sensor choices (Exhibit 11). It works by sending a laser from the vehicle and measuring the return as it reflects off of objects, creating a 3D map in a circular radius around the car. Recent developments have increased range to an excellent 200 meters, necessary to prompt a full stop for a stationary object at highway speeds, with parallel improvements in resolution as well. The map is unusually complete, even offering some perspective on objects that might be behind other objects, but visible on reflection. It is also entirely independent of ambient light, working as well in complete darkness as it does in bright sunshine. LiDAR offers excellent assessment of the distance to objects and their speed, and because of the accuracy and completeness of its data, the in-vehicle processing requirements are relatively modest. However, LiDAR is disrupted by heavy precipitation or thick fog and it cannot discern colors or writing. Because of this, LiDAR is always supplemented with radar (which is much less effected by weather) and cameras (which can fill in colors and signs). LiDAR is also the costliest sensor choice, by far. The 64 laser Velodyne system employed in Google’s cars had an initial sticker price of $75,000, but a 16 laser unit with somewhat lower resolution now runs at less than $10,000, while a planned 8 laser system from Quanergy will sell for under $1,000. While this trajectory suggests that viable LiDAR solutions could hit a $100 price point within 2-3 years, it will still be more than a magnitude more expensive than cameras or radar sensors. We note that current LiDAR systems are roof mounted in domes and contain moving parts, future LiDAR systems may use a flash technique that would allow sensors to be distributed to the perimeter of the car and would contain no moving parts. Of course, this approach is a few years behind rotary scanning LiDAR, and thus, still further up the cost curve. In contrast, cameras are cheap, with superior resolution, excellent range, and very good image completeness (Exhibit 12). Unfortunately, camera performance can be severely compromised by shadows, darkness, precipitation or fog. Distances are difficult to infer from the 2D images and speed cannot be measured at all. Moreover, the dense, flat images provided by cameras require significantly greater processing power than the 3D maps created by LiDAR. Because of this, the MobileEye solution, until very recently the choice of Tesla and the most popular camera-based sensor for self-driving applications, limits itself to a 150 degree forward view from behind the car’s rear view mirror. The biggest question on camera-dependent autonomous driving systems is the progress that can be made by deep learning toward inferring an accurate 3D map from the fusion of the 2D images supplemented by radar. 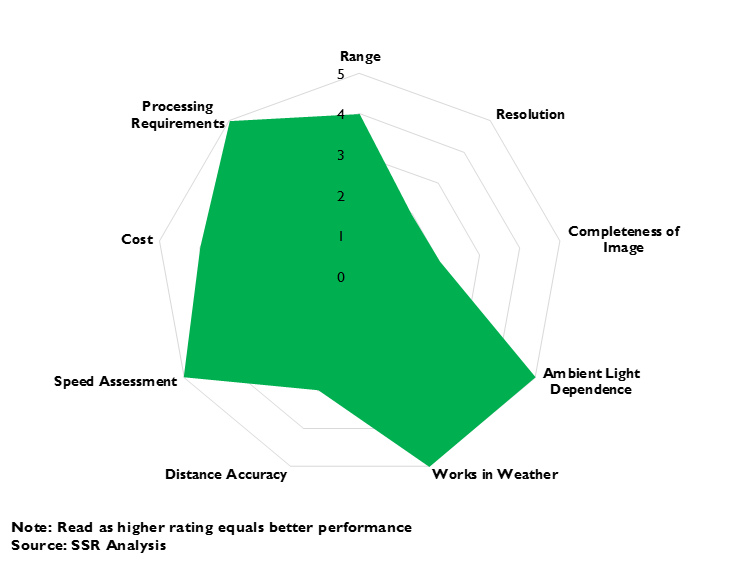 Radar fills in gaps left by LiDAR and cameras (Exhibit 13). It is cheap, with outstanding range. It does not require ambient light and it is not affected by weather, including blinding snow storms or thick fog. Radar is excellent at judging object proximity and relative speed. However, radar has relatively poor resolution – it may not be able to tell if an object ahead is in your lane or next to it – and it offers a dangerously incomplete map. Radar is much better at identifying hard objects – it often fails to flag pedestrians or pets. It can be confused by stationary objects. It cannot see color or writing. Because of these limitations, Radar is never used as the sole sensor for autonomous vehicle vision. Fusing the input from multiple sensor types into a single map can eliminate some, but not all, of the weaknesses of a single sensor solution, and all serious contenders use a fusion approach (Exhibit 14). The disruptors are combining LiDAR, cameras, and radar, with cameras providing important resolution, and identifying colors, writing, human gestures, and other key details. Radar provides important coverage during inclement weather, although we believe that fleet operators would likely err to the side of caution and sideline the vehicles during particularly bad conditions. Incrementalists, led by Tesla and MobilEye, are looking to work around the weaknesses of cameras and radar without adding expensive and bulky LiDAR gear. The biggest concern is the ability to discern pedestrians and other “soft” obstacles and accurately judge their proximity, particularly in dim light or precipitation. Eliminating LiDAR also puts more pressure on the AI system and its processor to infer a 3D map from the incomplete picture provided by cameras and radar (Exhibit 15). Essentially, the incrementalists are betting that their AIs get better fast enough to make LiDAR unnecessary before LiDAR gets cheap enough to make its exclusion an obvious liability. Once the autonomous vehicle has a detailed real-time 3D map of its surroundings, it is time to drive. The decisions – accelerating, braking, signaling, turning, etc. – are made by an on-board AI system birthed from training a deep learning model through millions of iterations through petabytes of driving data. 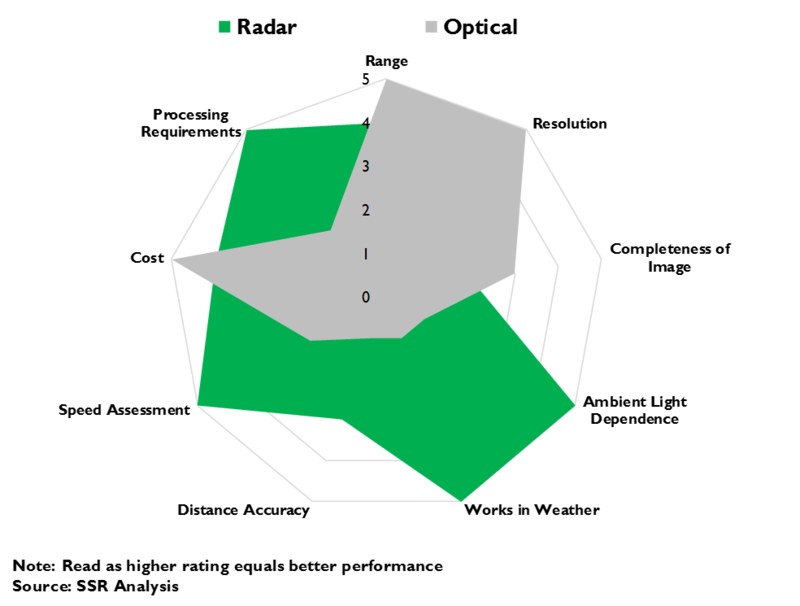 The quality of those decisions, gated by the quality of the 3D map, flow from the ingenuity and experience of the scientists that create and tweak the model, the breadth and depth of data available to train the model, and the time and capacity to run as many iterations as possible. Talent may be the most important element. While the building blocks of deep learning system are fairly simple, autonomous driving is the sort of highly complex problem that requires hundreds of thousands of interconnected algorithms arranged into a dozen or more layers. Managing the gestalt of such complex models, requiring constant reworking of the feedback loops within and between the algorithms to accelerate useful learning, is as much of an art as it is a science. Mental horsepower, elite training and years of experience matter – a lot. No company has more deep learning intellectual firepower than Alphabet. We have identified the 850 most cited experts on deep learning – 44% of those work in private industry, and nearly a quarter of those work for Alphabet. 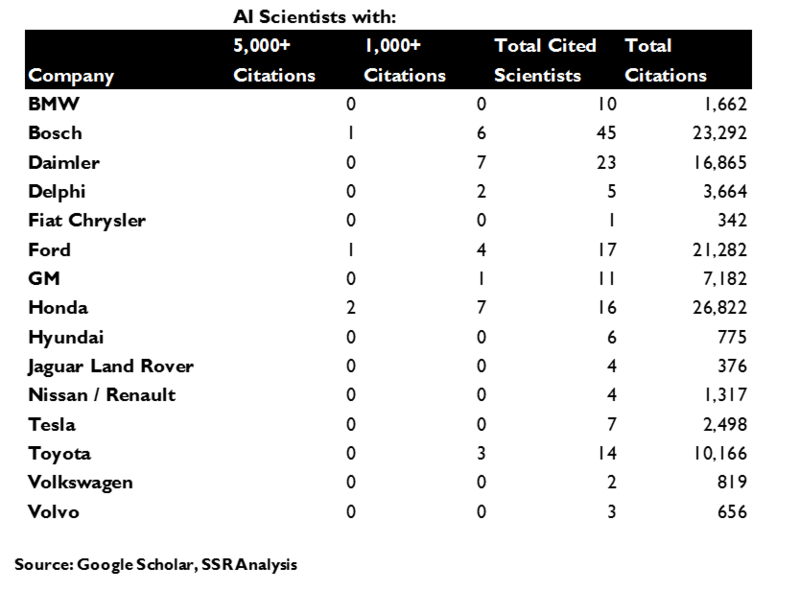 It has 83 scientists with more than 5,000 citations in academic journals, and 232 with more than a thousand (Exhibit 16). It claims to have more than 2,500 engineers that are fully competent to program deep learning systems. While these resources are spread throughout a large and ambitious company with many AI opportunities at hand, it has been working on autonomous driving for eight years and devoted many of its best to the project. Baidu is also an AI powerhouse, with 20 scholars that have been cited 1,000+ times in western journals, plus Chinese talent that is much harder to quantify. It has been working on self-driving technology since at least early 2014, when it announced a partnership with BMW in China. Uber gutted Carnegie Mellon University’s prestigious National Robotics Engineering Center in early 2015, hiring away 40 scientists and researchers with experience on autonomous vehicles and setting up its own research center in Pittsburgh. CEO Travis Kalanick has called self-driving technology an existential threat to his company, an urgency reflected in his aggressive pursuit of AI talent – which included the $600M acquisition of Otto, an autonomous trucking startup founded by former Google self-driving car technical leads. The other AI leaders – Microsoft, IBM, Facebook and Amazon – have largely stayed out of the autonomous vehicle race, although Microsoft has deals to help both Volvo and Toyota in their efforts. MobilEye’s founders are both scientists that have been cited more than 5,000 times, and the company has a strong research relationship with Israel’s Technion national technical institute. Honda, and Daimler lead the auto industry, each with 7 scientists topping the 1,000 citations threshold, with Bosch just behind at 6. Of these, Honda has 2 with more than 5K and Bosch has one. Ford, Toyota, Delphi and GM have 4, 3, 2 and 1 1K scientists respectively, with one of Ford’s topping 5K. 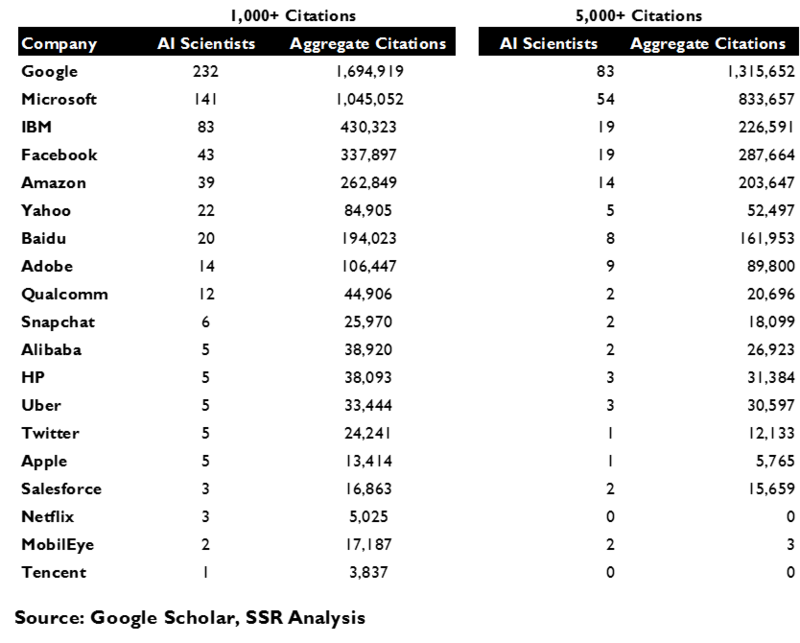 None of the other automakers or their suppliers have even a single scientist with at least 1,000 citations in AI related academic papers. Tesla, for example, has just 7 employees who have been cited even one time, with its most decorated deep learning scientist just shy of the 1,000 mark with 972 citations (Exhibit 17). 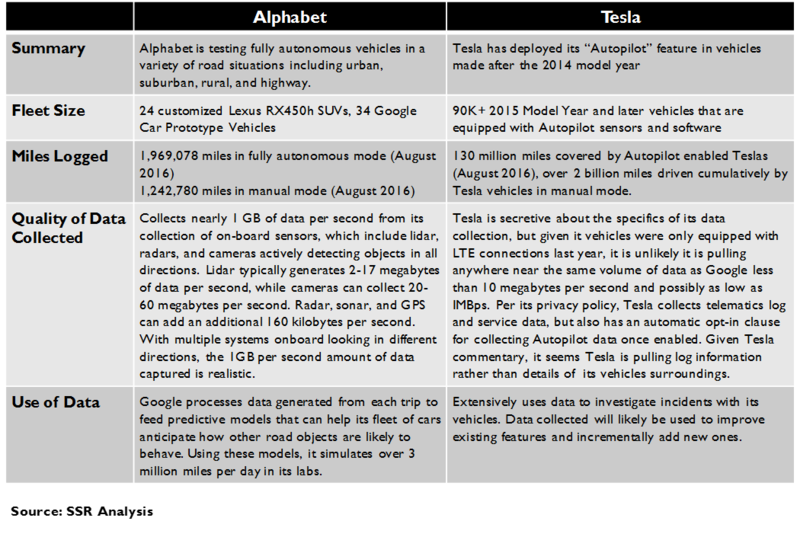 Data is also critical, with Alphabet and Tesla representing contrasting strategies. Alphabet’s Google cars have logged data from more than 3.2 million miles, nearly 2 million of them driven autonomously. For each second of driving, Google collects nearly a gigabyte of 360-degree image map data from its LiDAR, camera and radar sensors combined with telematics data about location, speed, and other operating activities. All in, this is a data base of more than 300 Petabytes (1015), against which Google runs driving simulations equivalent to roughly 3 million driving miles every day. 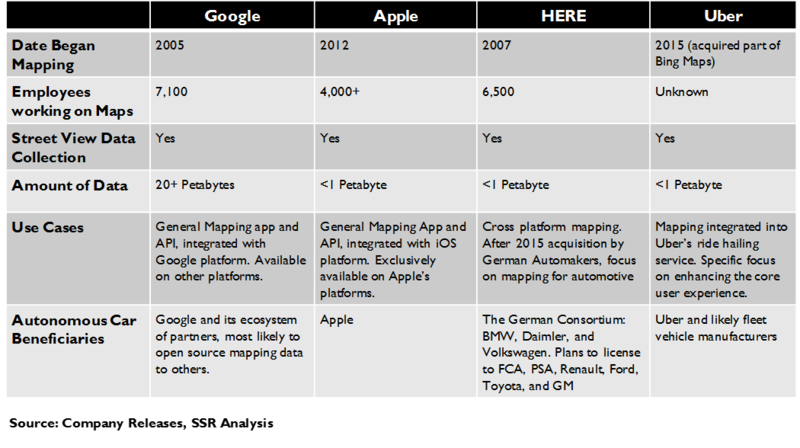 Where Google’s driving data is deep, Tesla’s is broad. The company’s boosters, including CEO Elon Musk, point out that with 70,000 Autopilot equipped cars on the road, it is collecting data on more miles each day than Google has driven autonomously in the history of its development program. We believe that this very misleading. First, Tesla collects significantly less data per mile driven from its 150-degree forward camera and 360-degree radar than does Google. While details of the data transferred are closely guarded, the limitations of cellular data connections (and home WiFi for possible bulk transfers) make flows of even 10MB/second extremely unlikely, leaving the resolution of Tesla’s data as much as 3 magnitudes behind Google. Second, most of Tesla’s data derives from highway driving, while Google has concentrated on local driving, which has a dramatically higher level of complexity for self-driving systems. Finally, with privacy concerns and transfer limitations, we do not believe that Tesla is collecting a video record for most of the miles that it has reported – autonomous car expert and blogger Brad Templeton reports that Tesla only downloads the full records for situations that are deemed out of the ordinary. Because of this, we believe that Tesla’s driving data is likely considerably less valuable to solving for full L5 autonomy (and possibly useless, if rumors of Tesla considering a testing program with LiDAR are true) than is Google’s (Exhibit 18). Meanwhile, other would be competitors have begun to collect their own data. Uber has stepped on the gas pedal (or the electric accelerator pedal, to be accurate) taking delivery of a fleet of 100 Volvo’s equipped with the preliminary self-driving system built by its Carnegie Mellon mercenaries. These auto-Ubers will offer taxi service in Pittsburgh, operating autonomously, but with an engineer alert to take control as needed. Baidu has been undergoing road testing with BMWs equipped with its first generation autonomous system and has gained approval to begin testing in California later this year. Ford has been testing in Michigan, with 10 of its Fusion sedans equipped with a full LiDAR kit. We note that Apple, which is rumored to be considering development of its own self-driving system, has not yet begun collecting data for such a system. While these companies have made substantial commitments, we note that Google will be taking delivery of 100 autonomous Chrysler Pacifica minivans to nearly triple its fleet of 24 Lexuses and 34 custom bubble cars and bumping its weekly autonomous mileage from 20-25K per week, to as much as 70K per week. Time and Capacity are also on Google’s side. Having worked with full autonomy as an end goal for nearly 8 years, Google’s scientists have made the mistakes that its rivals have yet to make, and have learned from them. Being able to run simulations and iterate its deep learning model on the world’s largest and most powerful computing infrastructure is an added bonus. Autonomous cars need to have a plan on how they are get from here to there. 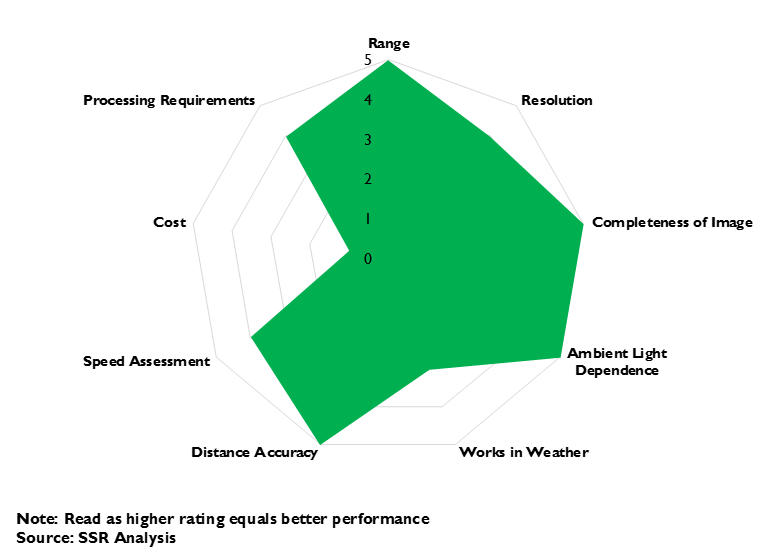 At the simplest level, this means maps, but for a computer driver, there are a lot of details that have to be better explained. Are there differences between the lanes of the road? Do the rules change based on the time of day? Is there a bike path? Are there pedestrian crossings? Is there a crest in the road that might temporarily reduce visibility for sensors? Do animals commonly make crossings? Is there typically a crossing guard or a traffic cop at certain times of day? What do the signs say – in case conditions make them difficult to read? Exactly where is the best door at an address for pickups and drop offs? Maps that answer questions like these will inform a self-driving system to be prepared, improving safety and efficiency. Moreover, the ideal maps will be completely up to date – not just with the permanent conditions of the roads, but with temporary changes as well. Traffic conditions, detours created by accidents or roadwork, patches of inclement weather – autonomous drivers need to know to adjust routes and driving strategies based on information like this. This will involve incorporating mechanisms to gather real time data from other vehicles on the road and quickly incorporate it into the map. With precise, up-to-the-minute map data in hand, self-driving vehicles will select or revise the route plan. Fleet operators will use the data to allocate trips to the vehicle best positioned to complete the job quickly, a task made considerably more complicated by enabling ride sharing with multiple pick-ups and drop-offs on route. 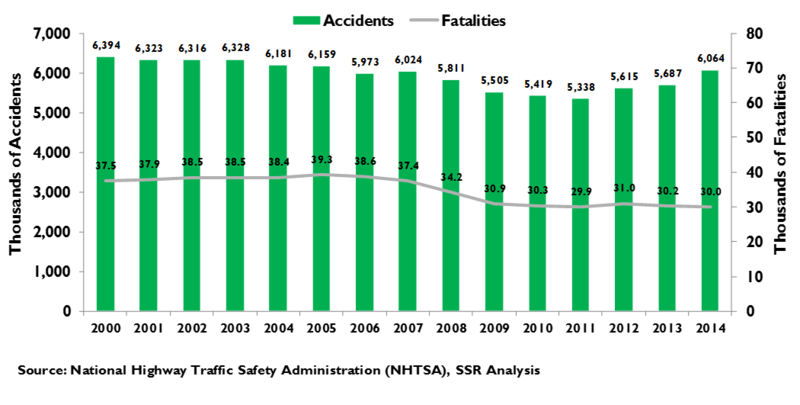 Transportation-as-a-service providers will compete with each other, in part, on the basis of timely pickups and efficient route choices for passengers, while effective trip allocation will be key in managing capacity utilization. Logistics systems will be a differentiator. This sets up an interesting contrast. Google is the acknowledged leader in maps, with its painstakingly collected street-by-street data and crowd-sourced Waze real time traffic updates. However, it is a bit of a neophyte in logistics with its 3-year old Express delivery service, offering overnight service in 22 markets with same-day delivery in 6 of them. In contrast, Uber’s logistics are a considerable strength, honed by completing more than 60 million trips per month across 70 different countries. Historically, Uber has relied on Google’s maps, but it has poached Google Maps executive Brian McClendon and earmarked $500 million to invest in building out its own layer of map details, expecting its erstwhile partner to keep its most granular data to itself once the competition really starts. It is not clear that anyone else is as well positioned. Apple has its own maps, although it may not have collected the same level of detail as Google and it has no experience in the logistics of fleet operations. Audi, BMW and Daimler Benz teamed to buy Nokia’s Here maps business, generally considered second best to Google, in 2015. They will have to invest to add detail and real time data, and to develop expertise in fleet logistics (Exhibit 19). Amazon has obvious strength in logistics, making it interesting as a dark horse partner for companies with cars and maps. The final technical element of Level 5 autonomy is coordination. Self-driving cars will need to communicate – with passengers, with other drivers, with humans directing traffic, with law enforcement officers, with the fleet, with other self-driving cars on the road, with the road and electronic signals on the road, with municipal authorities who may make temporary changes to regulations, and other sources of information that may not be apparent to the vehicle’s sensors. Coordination will have particular importance to a fleet operator, which must manage the processes of receiving and fulfilling requests from would-be passengers. These systems will direct idle vehicles to appropriate waiting zones based on the anticipated pattern of coming requests, with unexpected volumes driving immediate shifts in deployment. This will drive customer wait times, capacity utilization, and compliance with regulations for idle taxi waiting. Solving for this will involve many technologies. Robo-taxis will have microphones inside and out to take spoken direction and to identify sirens and other alarms. They will use cameras to receive and interpret gestures, like a cop waving traffic through an intersection. They will have radio connection to the fleet operator, which will deliver instructions and relay requests from passengers entered via an app. WiFi inside the car may enable direct communications from the passenger. Special radio channels may be reserved by governments for vehicle-to-vehicle communications, giving signals for managing rights of way, for coordinating efficient “platoons” of closely spaced vehicles, or for alerts (malfunctions, etc.). The cars may also use radio connections to receive information from municipalities, building managers, and other authorities. Some people have postulated that roads of the future will have sensors and radios embedded in them, delivering feedback to help coordinate safe and efficient autonomous vehicle operation, including platooning. The inputs from all of these sources will need to be incorporated into the driving and navigation systems of the car. By now, most of the executives in Silicon Valley and Detroit (and Germany, and China, …) have a copy of Clayton Christensen’s “The Innovator’s Dilemma” on their bookshelves. The central idea of the book is that disruptors, free from the need of satisfying demands from existing customers, often can use a technological approach that is initially inadequate for the needs of those customers to reimagine the concept of the product category and, thus, surpass the offerings of the incumbents. This seems to be a textbook case on many levels. The incumbent paradigm is privately owned vehicles. The first challenge was transportation-as-a-service, as pioneered by Uber. Small minded analysts initially tagged its addressable market as limited to taxis and limousines, laughing as the company’s double-digit billion-dollar valuation crept upward. 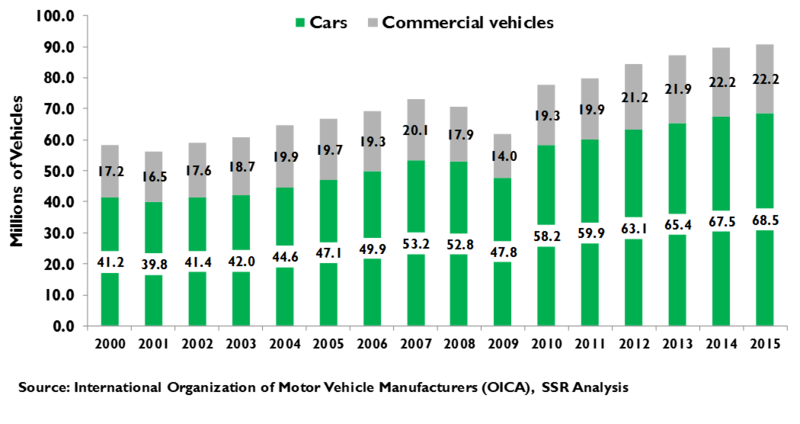 With time, the idea that convenient rides on demand could be a direct substitute for private vehicle ownership began to sink in, and although Uber’s revenues remain less than a 10th of a percent of the money spent globally on cars, long term growth expectations have brought the company’s value to more than $60B in the private market. Autonomous vehicles turbocharge this opportunity. 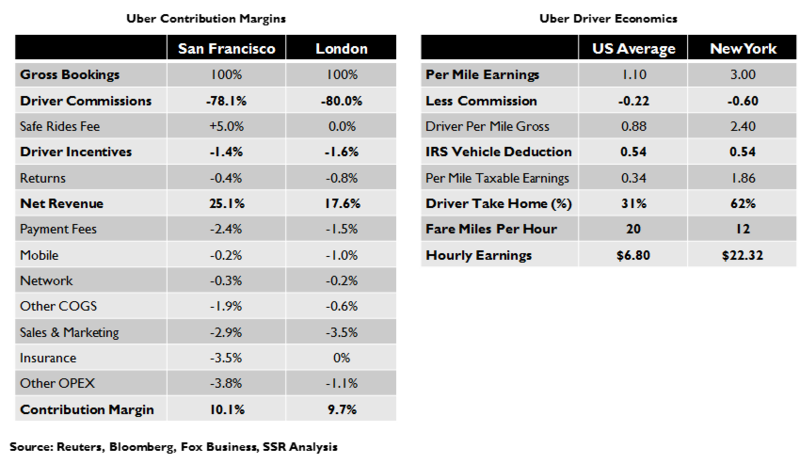 Driver commissions represent roughly 80% of Uber’s revenue, of which about half covers the operating costs and depreciation of their vehicles (Exhibit 20). Obviously, self-driving cars will eliminate driver compensation, but vehicle costs could be significantly lower as well. 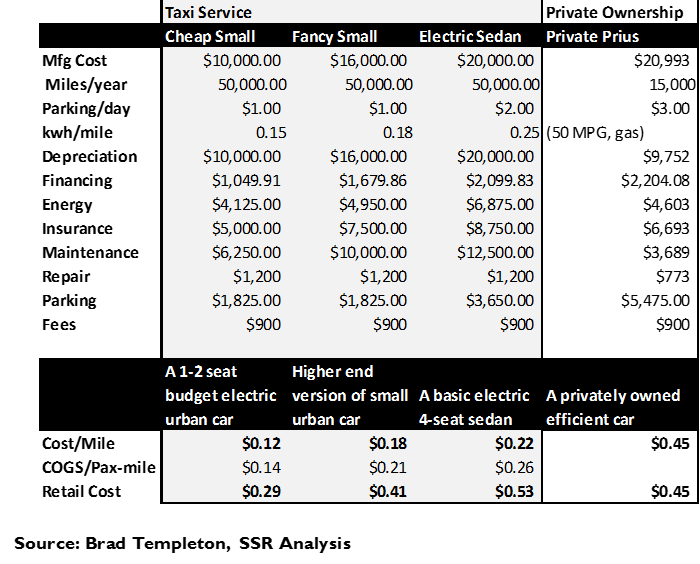 Brad Templeton recently published a model by which he estimated that a 4 passenger robo-taxi (including LiDAR) might have all-in per mile costs less than half that of a privately owned Toyota Prius (currently the lowest cost of ownership vehicle on the market), excluding the cost of a hired driver (Exhibit 21). The disruptors – led by Alphabet, Uber, Baidu, and, surprisingly, Ford – are looking to jump directly to full Level 5 autonomy. They are committed to LiDAR, believing that as the market emerges, volumes will bring the cost of high resolution, solid state flash LiDAR to sub $1,000 levels. As such, they are building their test systems and collecting road data based on the assumption that they will have vehicles with similarly high performance sensor arrays at reasonable costs. Developing fleet vehicles that will not have the safety net of a human driver ready to intervene is forcing an extreme focus on identifying potential problem situations and anticipating unusual events. The payoff will be in safety and efficiency, parameters that will be critical to gaining government approvals, licenses and public acceptance. Meanwhile, the incrementalists – led by Tesla, MobilEye, Bosch, Daimler, BMW and others – are emphasizing autonomous features that might differentiate their cars aimed at private buyers. The decision to exclude LiDAR for current products renders road data of very low value if future L5 vehicles will include it. Without LiDAR, these companies are betting that deep learning driven image processing will improve enough to make the performance differences for safety and efficiency superfluous. This could be a tall order, given the increasing confidence that disruptive L5 services could begin to launch before the end of the decade. Moreover, transitions between driver control to vehicle control and back are a high potential point of safety failure – incrementalists will need to address them in fine detail, while the disruptors can ignore them. We believe that automakers will continue progress in delivering autonomous driving features for cars sold to individual buyers, but that it is unlikely that any single manufacturer will generate a sufficient advantage to drive meaningful share shifts just on the basis of the driverless capabilities. However, parts makers, like Bosch, Delphi and MobilEye, could expand their share of a car’s bill of materials as more car makers expend their autonomous offerings. This is also true for semiconductor suppliers, like Nvidia and NXP, which have targeted these systems. The payoff for the disruptors will be much longer in coming. While we expect commercial deployments of completely driverless transport-on-demand services in select cities before the end of the decade, gaining scale will take years of adding new markets one by one with commensurate early investment that could push profitable operations to 2025 or later. By 2030, we believe that autonomous fleets could be a $100B+ global market. By then, transportation-as-a-service will be a significant drain on the sale of private vehicles. Alphabet’s Google cars have been operating since 2009, logging more than 3.2 million miles, nearly 2 million of them driven autonomously, generating nearly a gigabyte of data for every second of driving. Its software team is running 3 million miles in simulation every day using the data to train its deep learning model, while the AI experts continually tweak the model toward better and better results. In short months, Alphabet will take delivery of 100 Chrysler Pacifica minivans equipped with its LiDAR forward sensor array and serious on-board processing power, bring its total fleet to 158 vehicles, each driving nearly 400 miles per day. This fleet can more than double the total autonomous miles driven in less than a year. 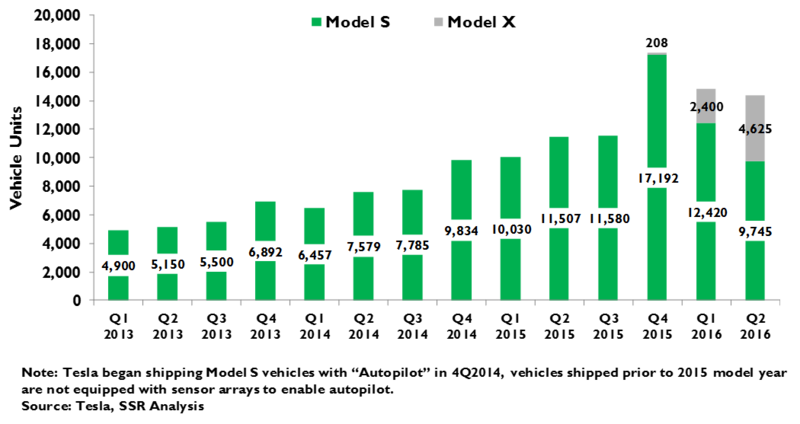 Google’s 300 petabyte driving data base would grow accordingly, challenging the Exabyte (1018) level by 2018. This is a gargantuan data base, and would be even if we were off by a factor of 10 in estimating its size. As a matter of contrast, the entire Google Maps data base was estimated at roughly 21 petabytes in 2012, although it has undoubtedly grown by multiples since, given the addition of greater detail, wider coverage and real-time traffic to the mix since that time. Very few companies have the ability to work with a data base of that size. Google is one of them, and its most vocal competitors are not. Add in Alphabet’s towering leadership in the science of deep learning. A full 25% of all scientists working for commercial industry that have been cited at least 5,000 times in academic literature work for the company. According to management, a full 10% of the 25,000 strong engineering force is fully competent in the technologies that make up deep learning. This is the organization that has been working on self-driving cars for nearly 8 years. Also important, those maps, with real time updates from Waze, are, by far, the most complete, detailed and accurate in the world. It will also help that Google has been working on fleet logistics as it rolls out its Express delivery program, that it has massive reach with its Android platform and its hugely popular apps, that it has some experience working with local authorities via Google Fiber, and that its self-driving initiative is already so widely known to the public. All of these factors make it the team to beat. We believe the recent changes to the Google self-driving team – the departure of scientist Chris Urmson as the project lead and the hiring of experience auto exec John Krafcik as group CEO, along with the addition of Airbnb’s Shaun Stewart to the team – show that the company is serious about monetizing this project, sooner, rather than, later. Uber gets points for believing in itself. CEO Travis Kalanick did the best he could, strip mining leading faculty from CMU’s School of Robotics, which had been working on self-driving vehicles as an academic project for 30 years. He also gave up 1% of his company to acquire self-driving trucking startup Otto, which came with a pair of founders that had cut their teeth as technical leads on Google’s project. The team in place, Uber must now build its data base, and to that end it has purchased 100 Volvo station wagons decked out in sensors like Google’s fleet. These vehicles will be transporting live customers in Pittsburgh under the supervision of trained engineers. Uber has obvious strengths in the Coordination facet of managing an autonomous fleet, and has been at work for a couple years on its own mapping data base, in an effort to wean itself from Google Maps. It also has the advantage of existing licensing relationships with municipal governments around the world. It may be too much to ask that the team catch up to Alphabet, but given its larger rival’s clumsy recent history in commercializing its research projects Uber has a fighting chance. Baidu is the local champion for China, which will happily remove any regulatory barriers for the company to test its self-driving mettle on live customers. Baidu also happens to have sufficient AI and data processing chops to play in the 100 petabyte data base club, so as its fully autonomous testing continues in partnership with BMW it is positioned to get to scale as quickly as possible. Baidu has also invested in leading LiDAR producer Velodyne (along with Ford), a relationship which could pay dividends with early looks at sensor arrays as they get smaller, more capable and cheaper. We see Baidu as a wild card that could surprise on a global scale. Apple, being Apple, hasn’t revealed much about its Project Titan car project. Silicon Valley scuttlebutt suggests that the company is working on self-driving technology, but without test cars on the road or significant AI scientific experience in the labs, we are very skeptical that the company will be able to differentiate on this functionality. If the Apple car turns out to be more real than the Apple television set, we suspect that the self-driving technology will not have been developed entirely in house. Tesla and its autopilot feature are the most aggressive commercialization of self-driving technology to date. CEO Elon Musk has been adamant that LiDAR is unnecessary to L5 fully autonomous operations, insisting that radar, in conjunction with cameras, can provide an accurate, detailed 3D map sufficient for completely safe operation under all conditions. Erstwhile supplier MobilEye is not nearly so confident, perhaps leading to the split between the two companies, and neither are we. Musk’s hyperbole around his firm’s data collection buries its threadbare shallowness in the mountain of miles driven. That shallowness, along with the surprising lack of AI scientific talent, call into question Tesla’s plans for delivering L4 autonomy by 2017. That, and the political slog in get approvals to operate at that level on local roads. Ford is the one incumbent that has committed entirely to the disruptor path. It claims to have been working on its technology since 2005, but it has only recently started collecting data from a small collection of kitted out Fusions operating around its Detroit campus. Like Baidu, it has invested $75M in LiDAR maker Velodyne, and expects to gain early access to the company’s coming product advances. The goal is to have L4 capable vehicles available to the market by 2021. Given Ford’s relatively meager roster of AI talent, we are skeptical that its solution will be as robust as those of its disruptor rivals. GM is playing both sides. It introduced forward collision and lane departure warnings with MobilEye technology in 2011, and plans to offer “Supercruise”, the equivalent of Tesla’s autopilot, to the Cadillac line in 2017. On the other road, GM teamed with Carnegie Mellon in 2007 to win a DARPA self-driving research challenge. Earlier this year, it bought disruptive startup Cruise Automation for $1B and set plans with Lyft to begin testing self-driving taxis by year end. However, CEO Mary Barra has lobbied strongly for regulations that would require autonomous vehicles to have steering wheels and foot pedals in the US. GM has a lot of bravado around its self-driving technology, but we are skeptical that it has the AI capabilities or driving data to beat its rivals to L5. All of the other automakers have at least one foot in the self-driving water. BMW has deals with Baidu in China, and with MobilEye and Intel. Daimler has been pushing self-driving features in its passenger cars, and has led a consortium of companies working on autonomous long-haul trucking. Fiat Chrysler is supplying vehicles to Google and Volvo is supplying them to Uber. Toyota has reversed its 2014 stance against self-driving on safety grounds and has pledged $1B investment to make up lost ground, including research partnerships with Stanford, MIT and the University of Michigan. VW teamed with BMW and Daimler to buy Nokia’s Here mapping business, and has plans for speed-limited self-driving in its next generation Audi A8 flagship. Honda, Nissan, PSA, Hyundai, Tata, Jaguar/Land Rover, and even Chinese bus maker Yutong are all known to be working on their own self-driving functionality. Bosch has 2,000 engineers dedicated to its driver assistance product lines, including self-driving functionality, and counts Google, Porsche, and Tesla amongst its customers for products like automatic emergency braking systems and 360-degree video imaging. It has kitted out two Teslas for full autonomous operation with roof top sensor arrays, and has been collecting test data for two years. We suspect that many of the incumbents will be receptive to working with Bosch to fill in the gaps of their own self-driving programs. Delphi is in a similar boat. It has aimed its work on L4 autonomy and has devoted significant resources toward addressing safe handoffs between driver and vehicle. It has a partnership with startup Quanergy to develop lower cost solid-state LiDAR, a technology with the potential of becoming an industry standard. Delphi is also working with Singapore-based startup NuTonomy to develop a robo-taxi pilot that it has been authorized to deploy in its home market. MobilEye has been the early leader in selling chips and software for camera-based partial autonomy capabilities, like Tesla’s autopilot. It recently severed ties with its erstwhile lead customer, claiming safety concerns with Tesla’s aggressive implementation of its autopilot feature, while Elon Musk accused MobilEye of trying to block his company’s internal development of machine vision technology. Industry mudslinging aside, MobilEye claims deals with 25 carmakers and is working with GM, VW and Nissan on a crowdsourced real-time mapping capability that automatically processes data from all three companies’ vehicles. As the auto industry grapples more seriously with their talent and data gap vs. the disruptors, we believe MobilEye is a natural partner for most of them. 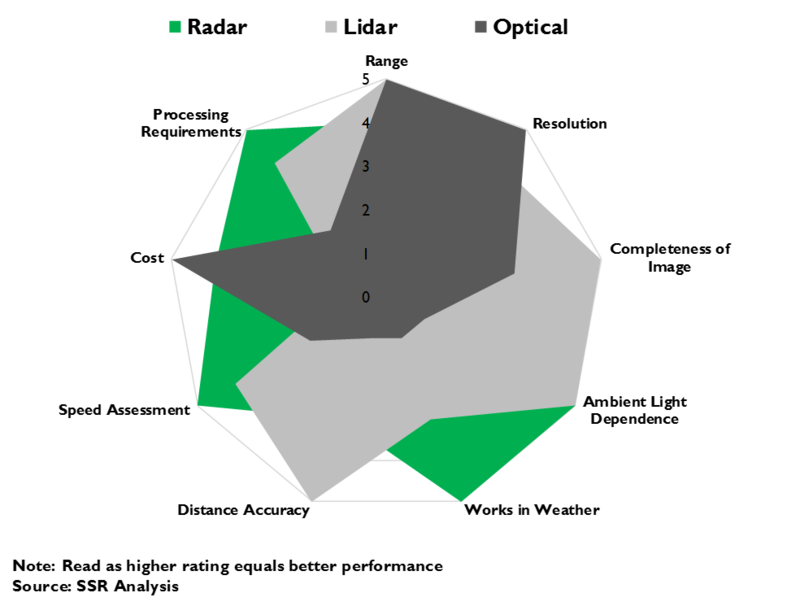 Nvidia has been the processor architecture of choice for deep learning systems in general, and self-driving platforms specifically. We see the proliferation of self-driving functionality across privately owned vehicles as a substantial opportunity for the company, with a reasonable chance that it can sell its high-performance processors to disruptors as well. While MobilEye currently dominates the machine vision element, Nvidia is the most obvious challenger as a component part of an alternative software solution. We recently added Nvidia to our model portfolio, and see automotive as one of the biggest drivers of its expected success. Velodyne and Quanergy are pre-public companies with technical leadership in LiDAR. Velodyne has been the LiDAR of choice for all self-driving tests to-date and has a product roadmap that will bring high quality sensors below the $500/vehicle threshold. Baidu and Ford have each made $75M investments in the company. Quanergy is focusing on delivering cost effective solid-state LiDAR, which would remove the moving parts as a potential point of failure and allow deployment to the perimeter of the vehicle (eliminating the cumbersome rooftop turret). Delphi recently led a $90m round of funding for the company. We believe both Velodyne and Quanergy have huge potential opportunities as true L5 autonomous fleets begin to proliferate.